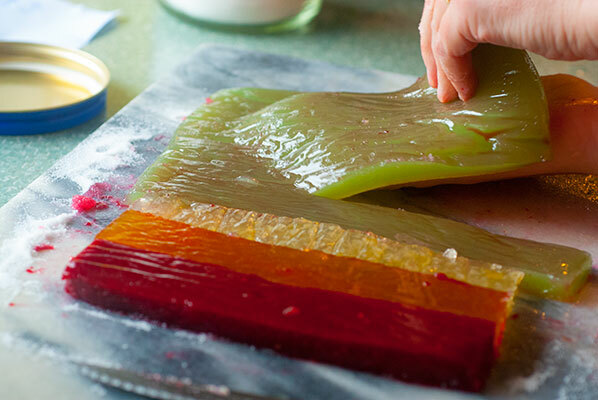 I am making a rainbow flag – in jelly. 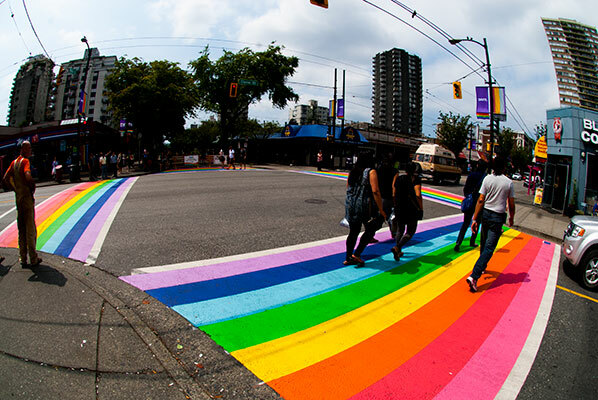 It’s Pride Week in Vancouver, culminating in the huge, colourful, float and fun filled Pride Parade on August 4th, through Vancouver’s West End, which is now sporting the world’s first permanent Rainbow Crosswalk, at Davie and Bute Street. There are rainbows everywhere, including the one I saw this morning – after our first day of rain in over 31 days (nearly a record for Vancouver). 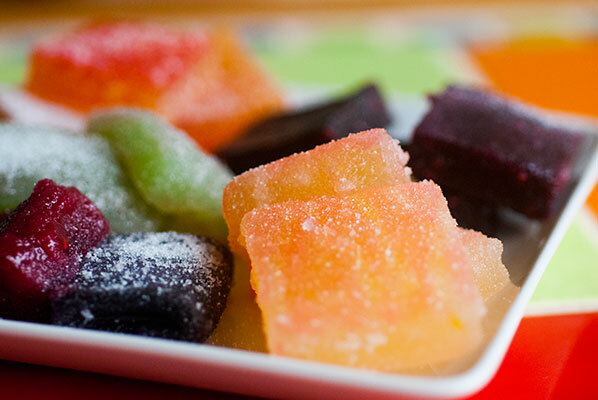 And because it’s fun, colourful and relatively easy to do in this hot weather, I am going to make six different flavours and colours of pâte de fruits, using the bounty of fresh fruit now in season. 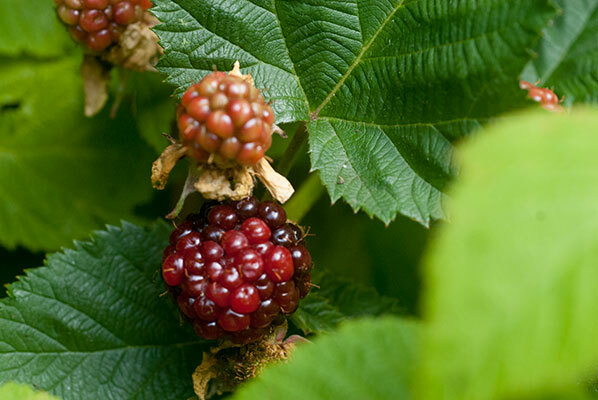 These include two of my absolute favorites: our glorious local blackberries, which grow wild on roadside bushes and mountain hiking trails, as well as being cultivated on local farms, and the luscious, buttery dripping in juice Okanagan peaches, which I have been gulping down like candy for the past two weeks. Oh, they are delicious, and in my opinion, are best eaten directly over a sink or outside in the grass. 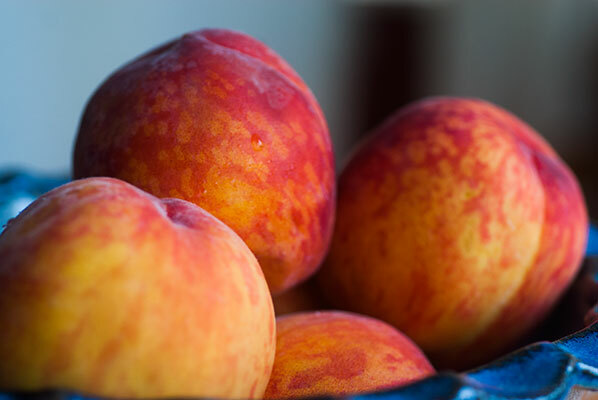 I have even been known to wipe a juice smeared hand on my jeans, just so I can retain the aroma of fresh peaches for a few hours more. If I am really lucky, my lovely partner may just decide to can a batch. We are down to the last nine jars of the golden beauties he did a couple of years ago. 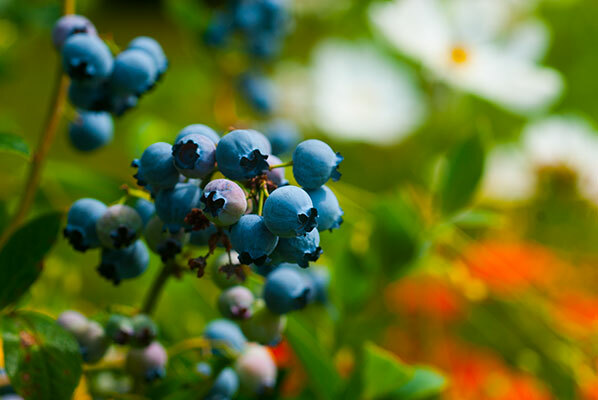 And for the blue stripe, the blueberries are still in season. In fact, the ones in our front yard are just coming into their own. 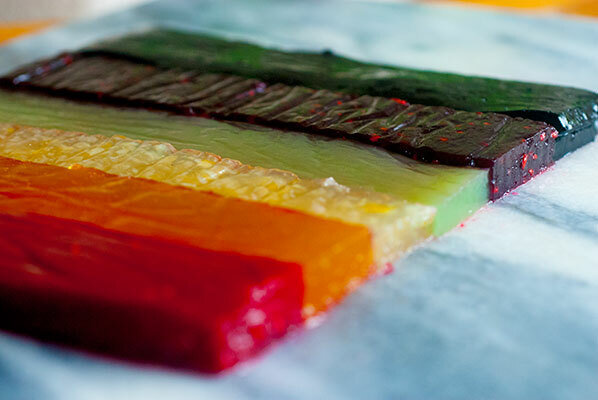 The rainbow flag has quite a few different variations, and the original Pride flag had eight different colours in it, but I am quite happy it was taken down to six colours, in 1979 (for my own selfish reasons – this means I only have to make six flavours). My pal Rachel Sawatzky of Cocoa Nymph Chocolates, makes a luscious blackberry pate and dark chocolate ganache bon bon, the Glinda, as part of her chocolate line. Store bought pectin will not do the trick, so look for apple pectin or yellow pectin from your chocolate or baking suppliers. It is very important to whisk the sugar and the pectin together before adding them to the hot fruit purée, and to add the acid at the last minute before pouring. 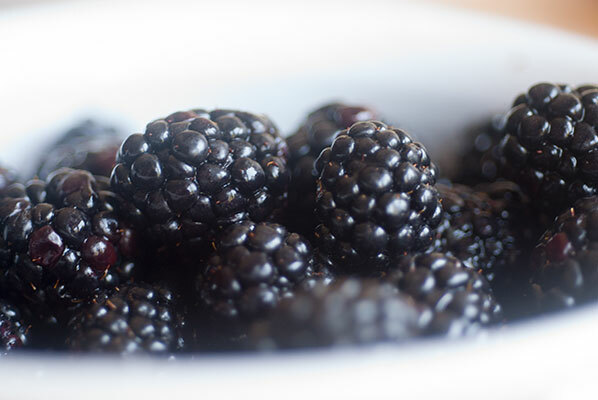 17oz 500g Frozen blackberry purée – You can substitute other berries in this recipe but not other fruits. Whisk the sugar and the pectin together, set aside. Bring the purée to a boil. Whisk the sugar/pectin mixture into the boiling purée. Cook to 112 degrees Celsius or 72 Brix. Whisk in the acid. Pour immediately. 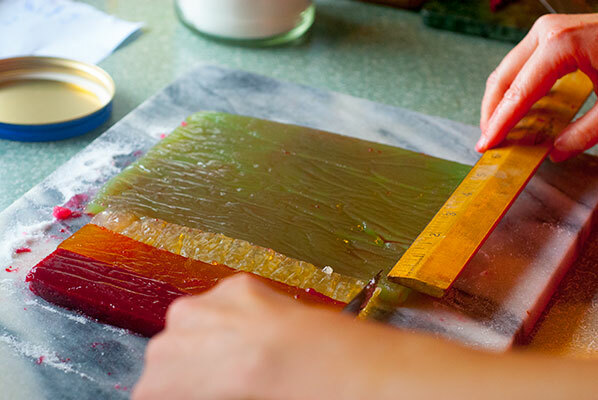 Pour into a frame on a silicone mat or into silicone molds, and allow to cool at room temperature. I had three boxes of Certo liquid pectin (which is extracted from lime peels), so I launched in to making a slightly different recipe, one I had successfully made previously, in lemon, so I made a batch of lemon, for the yellow stripe, then a batch using Key limes, for the green. 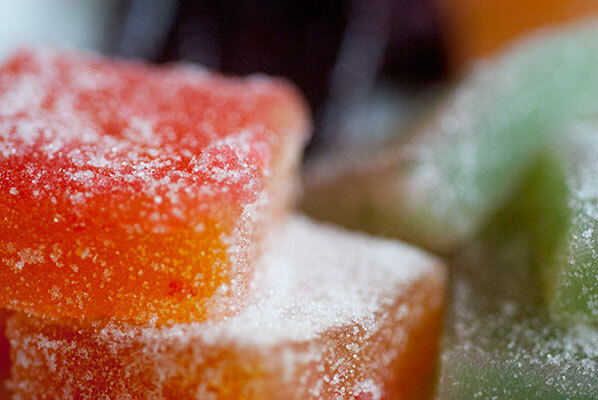 Thanks for this pâte de fruit recipe from Zoë François at Zoë Bakes. 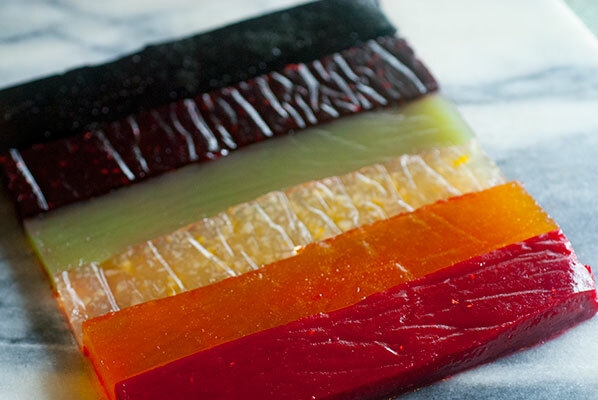 Zoe’s three recipes are for citrus based pâte. 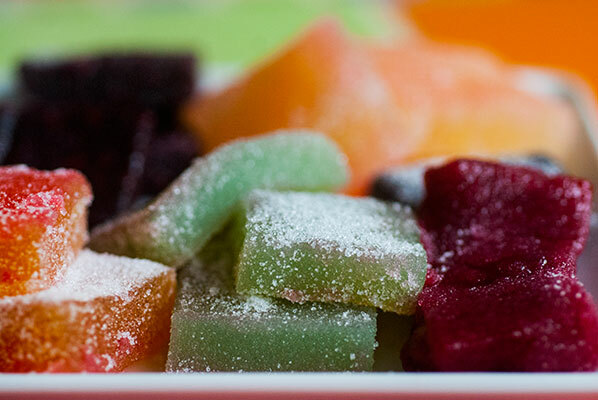 Citrus fruits have naturally high amounts of pectin, and will gel easily, along with other high pectin fruits such as apples, crab apples, cranberries, currants, gooseberries, plums, grapes, and quinces. I thought, since the Key limes I was using were so small, I would prepare them using the method she suggests for her kumquat pâte. Big mistake. Even though I cut the Key limes in quarters, and removed the seeds, they were still far too chunky for my poor old food processor to deal with without additional liquid. The ratio of lemon juice used in the lemon version makes the small amount of whole lemon added to the machine no problem, but I ended up with bits of lime and juice all over my kitchen, when the lid of my food processor flew off! Lesson learned. After shouting a few curses and wiping down my kitchen (it smelled good, at least), I re-read Zoe’s excellent instructions, began again, juiced the limes, processed a couple of cut up ones with the juice, strained the mixture, measured out 1 ½ cups of juice, and proceeded as with the lemon recipe. 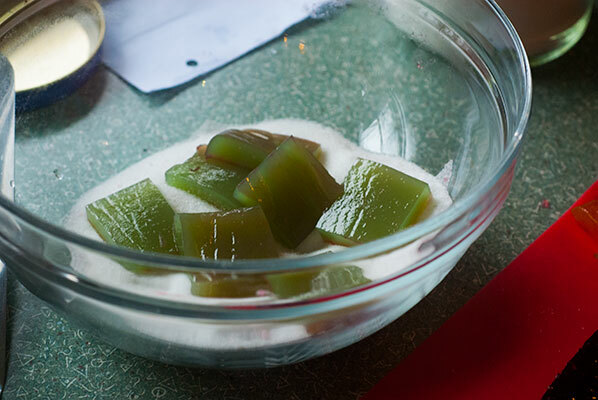 I did add a couple of drops of green food colouring to the mixture, when I stirred in the pectin, and they soon started to set up. I had three successfully set pans of pâte in my refrigerator (I have only got two 8 x 8 inch cake pans, and I wanted all of the batches to be the same size, so by chilling them in the refrigerator I was able to lift them out of the pans, once set, enabling me to use the pan for the next batch). For the peach layer, I found a lovely recipe here, adapted from Tartelette, also using Certo pectin. It definitely takes patience to keep the temperatures in the correct range, in this recipe, but it really does work, and these came out a nice consistency. And then, my hour of shame. I have remarked before that I am not a patient person. I do not know what got into me, but since I had run out of both kinds of pectin, and wanted to get all the colours finished, and since I had made a successful batch of strawberry pâte de fruit two years ago using gelatin, but I decided that I would make the raspberry and blueberry batches using gelatin instead of pectin. And I rushed. 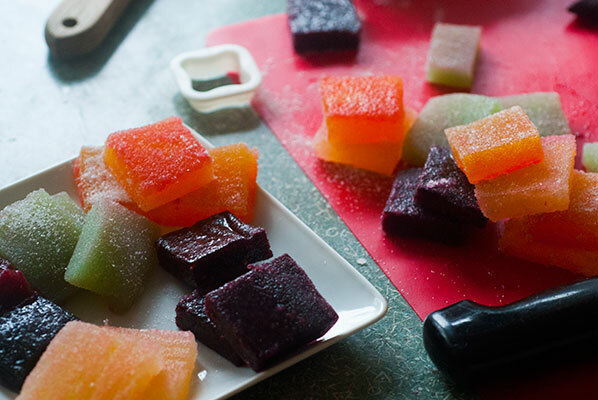 I do not know what precisely where I went wrong, but I suspect I did not boil the fruit/sugar long enough, or add enough gelatin. Suffice to say, the final two batches came out looking more like organ meat (liver, to be precise) than lovely springy pâte de fruit, but I was humbled and weary, and with four good batches, I managed, with the assistance of my very patient partner, to salvage a strip of each of these last two miserable batches, to put into my flag. I scraped the rest of the two failed batches into Mason jars, and stuck them in the refrigerator. Perhaps I’ll be able to salvage them as ice cream toppings. The other four batches, we cut up and rolled in sugar, and I can honestly say, they taste pretty great. I am going to put them in Mason jars and bring them to a party this weekend, a celebration with dear old friends. They look as pretty and as celebratory as I has hoped. Happy Pride.